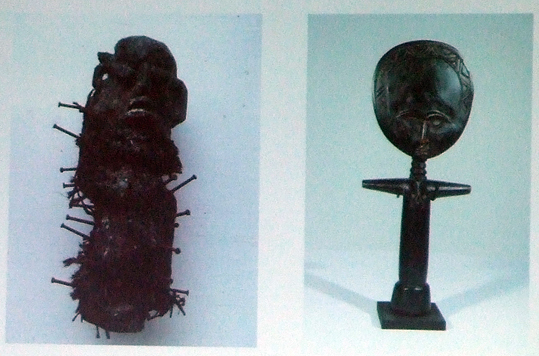 At the start, Dr Fenton said that she has been researching the representation of voodoo for 20 years. In that context, she has worked with priestesses in New Orleans also with Haitian Voodoo practitioners. 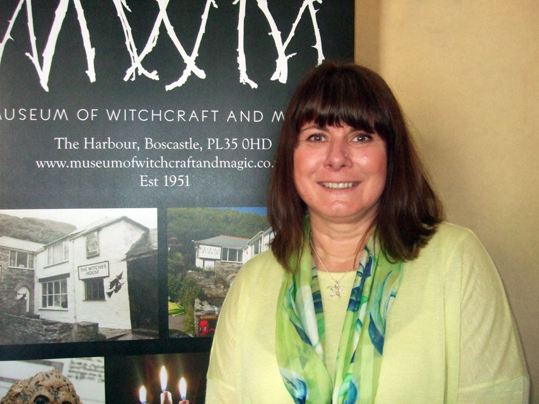 It was her academic work in that field that brought her to Boscastle’s Museum of Witchcraft and Magic. She started her talk with a focus on poppets, which are dolls used for magic. 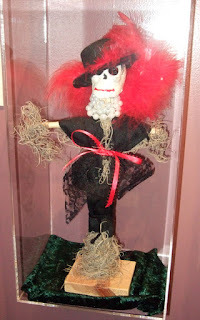 She said that dolls feature in multiple cultures throughout history and have been used for healing and love spells. Traditional European folk magic has dolls stuck with pins as a stereotype, but before that sympathetic magic goes back thousands of years. In Ancient Egypt, Ramesses III was said to have been killed by wax image magic. Ancient Greeks used sympathetic magic for love spells and defense - Kolossoi are Greek dolls that were said to contain spirits, but were also also used for harming. One old description is of putting an image in a lead box inscribed with a curse, designed to be hidden or destroyed. The lead boxes were disposed of where they could not be brought back - buried in graveyards or at sea, for example. The counter curse is to dig them up and unbind them. The Greek poet Theocritus in his Idylls wrote about love magic using curses with effigies. The Wonderful Discovery of Witches by Robert Potts, written at the time of the Lancashire witchcraft trials, shows that considerable evidence against the women involved clay images. Elizabeth Sowtherns, alias Demdike, confessed that the quickest way to murder someone was to make a clay image, take a thorn or a pin and put it in the body to consume away, then burn it. It is believed that slaves brought to Haiti either brought fetishes made of wood or clay with them or made them afterwards. 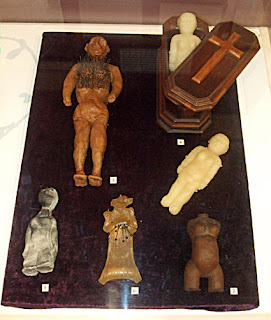 The death penalty was a possibility if a slave was found with one of these, so it is possible that cloth dolls started at that point. Poppet magic was made popular in New Orleans after the Civil War, but there are disagreements about the use of poppets historically in that region. There is not much evidence of poppet use in Haiti, but there is in New Orleans. In 1865 plantations owners went to Louisianan with slaves and Haitian voodoo came to New Orleans; there was a huge mix of cultures and voodoo changed quite a lot at that point. In 1890 The Golden Bough was published. A passage in that gives an overview of how cursing was understood and mentions the use of poppets and dolls. Another description says that drawing a figure of a person in sand, ashes or clay and pricking it with a sharp stick does a corresponding harm to the person represented. "Wherever the needle pierces, his foe will be seized with a sharp pain, but to kill him burn or bury it." There is an awareness that this was happening on a global scale. Boccio are carved images from Africa that are connected with magic. They were used as African magic merged with European and were traditionally designed to be mediators with the spirit world - both positive and negative. 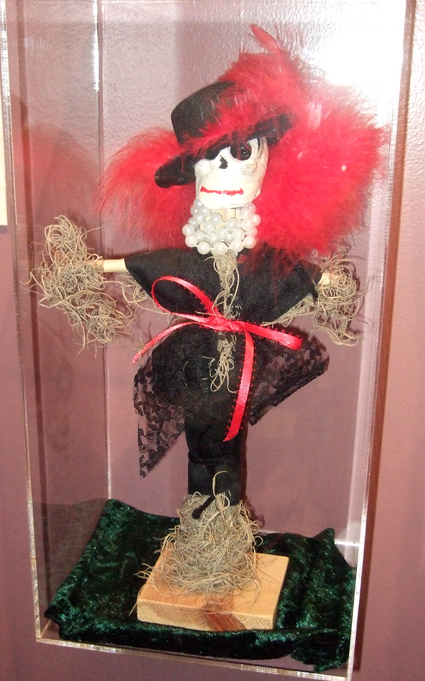 Voodoo dolls started in New Orleans in the late 19th century. With both artistic and cultural collision, poppets and boccio merged into voodoo dolls. This is not something that happened a long while ago; it is very much of today and still being practised. The concept became popularised through things like William Seabrook’s The Magic Island, published in 1929, which gave a vivid account of voodoo in Haiti. It was a very racist book, but much of this was lifted and used in the movie White Zombie starring Bela Lugosi. Lafcadio Hearn actually wrote the first zombie novel, but many others followed – usually very inaccurate and offensive. Cannibal Cousins by John Craige mentions someone in Haiti finding a doll made in his likeness and in his clothes. He then gets ill. These books sold in their millions and there were also several highly racist films following White Zombie. They perpetuate myths and are cinematic. However, they popularised the use of the voodoo doll. The words witchcraft and voodoo started to be used together. Commercialisation of poppets was unavoidable although for many the emphasis was on making money without understanding the background. You can can buy poppets for sale today. In New Orleans poppets are sold with Spanish moss hands and feet. However, there are original dolls in collections. Many from the 20th century are vernacular and of their time. They are often knitted from patterns widely available. The commoditisation of voodoo dolls in New Orleans has continued. For example, some come with white and black headed pins (and "made in China" printed on the back). Dolls authentic to New Orleans rarely have pins with them. They are often made of papier mache and Spanish moss and not a pin in sight. Curses are available, but very rarely will priestesses offer to do curses. Witchcraft is also emerging in the French quarter and is more open. There is some suspicion and wariness between voodooists and witches in the French quarter. To round up, Dr Fenton said there has been a collision of European and African traditions, but the exhibition Poppets, Pins and Power aims to explain the differences between the two. Poppets, Pins and Power, the exhibition on the craft of cursing with poppets, is on at the Museum of Witchcraft and Magic, Boscastle, Cornwall until the end of 2017. Pictured (from top): Dr Louise Fenton at the Museum of Witchcraft and Magic conference, poppets and magical dolls at the exhibition, photo of slide from Dr Fenton's talk showing wooden figures, The Golden Bough cover, The Magic Island cover, doll from the exhibition.